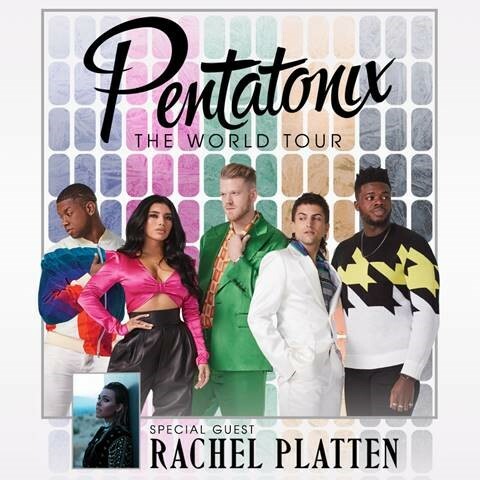 (February 7, 2019 – Los Angeles, CA) Three-time Grammy Award-winning and multi-platinum-selling artist Pentatonix have announced a 45-date tour produced by Live Nation to kick off their World Tour. Emmy Award-winning, multi-platinum-selling recording artist Rachel Platten will join as special guest on all dates. The North American dates will begin at Oracle Arena in Oakland, CA on May 11th and include stops at the “Fabulous” Forum in Inglewood, California on Thursday, May 16th and Madison Square Garden in New York City. Additional cities, countries and continents will be announced soon. The award-winning “Fabulous” Forum, located in Inglewood, CA, is the largest indoor performance venue in the country designed with a focus on music and entertainment, in addition to select sporting events. The interior of the bowl features flexible seating that ranges from 17,500 seats to 7,000 seats, enabling the venue to attract a wide variety of premier events. Fans at the Forum enjoy approximately 8,000 square feet of event level hospitality offerings, including merchandise, along with food and beverage options from some of SoCal’s most celebrated brands. A tinted glass wall separates this concession area from the arena, ensuring fans do not miss a moment of the performance. A 40,000 square foot outdoor terrace surrounds the perimeter of the building and offers food and beverage options, as well as comfortable furnishings, to further elevate guests’ enjoyment. The Forum delivers a one-of-a-kind experience for all thanks to its superior acoustics, intimate ambiance and state-of-the-art facilities. Designed with entertainers and performers in mind, the venue includes nine, star-caliber dressing rooms that provide unparalleled comfort. The Forum is part of The Madison Square Garden Company’s portfolio of iconic venues, which also includes: New York’s Madison Square Garden, the Hulu Theater at MSG, Radio City Music Hall, the Chicago Theatre, the Boch Center Wang Theatre, and the Beacon Theater. For more information, please visit www.fabulousforum.com.